Passion. Family. Education. Love. Too often business owners forget to answer the most important question- why? Why is their business special? Why provide this particular service? Why keep going? Why choose us? As a business owner, showing your why and understanding your why is so vital to being successful. Customers appreciate when business owners have a deeper reason for creating a business. Consider Avant Gardening, a woman-owned landscaping business that was recently named as one of Dane County’s top ten small businesses, Doing It Right”. Their “why” is nature. This business has a passion for nature’s beauty that is contagious. While customers may not initially be drawn to a company because of a business’s passion for nature, it is an inevitable discovery. Everything about Avant Gardening reflects this core value including their messaging and branding. Once a business has established a core value or “why,” branding and marketing becomes easier. Graphic design firms visually translate a business’s “why” into a stunning design. We often find our first step when working with a client is to figure out a business’s why. Whether it be through colors, logos, or websites, graphic design is meant to continually remind customers of a business’s main purpose. If a business owner fails to understand their core reason, it is possible for mixed messages and branding. Customers may become confused about expectations which can lead to unsuccessful service. In contrast, a business that has a good understanding of their why tends to have a more successful business. In order for a business to truly be successful, not only do they have to have the business capability, but they need a “why”. 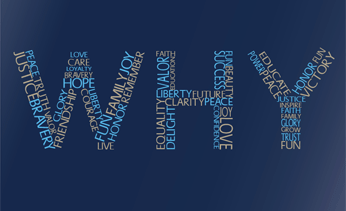 Whether it be a reason such as a passion for nature, a drive to support family, a desire to educate, or a deeper need to spread love, business that “show their why” will be more successful.